Mary Crutchfield, a native of Arlington, Va., makes her home in Elizabeth City, NC. She received her education at Radford College, Va., the University of Arizona in Tucson, and U.N.C. at Chapel Hill, N.C. , receiving B.A. and M.S. degrees. She has studied watermedia with Alex Powers, Charles Reid, Ralph Smith, Carole Barnes, Katherine Chang Liu, Mary Todd Beam, Glenn Bradshaw and others. She is a long-standing member of the Studio Gallery in Elizabeth City and conducts painting workshops in North Carolina and Virginia. 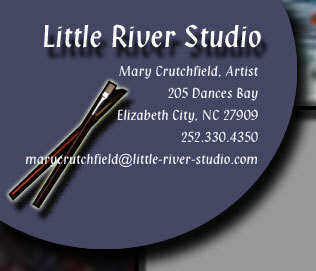 Crutchfield has exhibited and won awards in many local, regional, national and international juried shows, and has been juried into and is represented in numerous museum, corporate and private collections in the US and abroad. She is a signature member of the Pennsylvania, Mississippi, Louisiana, Georgia, and North Carolina Watercolor Societies, as well as the Southern Watercolor Society, International Society of Acrylic Painters, Arizona Aqueous, and the International Association of Experimental Artists. She has had work in an exhibition for the blind, which traveled through many cities in Germany. She has exhibited in many one-woman shows, including the Louise Jones Brown Gallery at Duke University, Durham, NC, and the Horace Williams Gallery in Chapel Hill, NC. She is a member of the Watercolor Society of North Carolina Board of Directors, and also serves as Historian.